Compared to SIMION® 7.0, SIMION® 8.0 includes various necessary changes, some limit and performance increases, some new capabilities, some usability enhancements, and the useful parts of the SL Toolkit. There is a 6-page SIMION 8 brochure available. Major revamp of user interface. Includes native GUI controls (more standard), OpenGL viewing of PA files (shown in the screenshot at the bottom of this page), reduced screen flicker (double-buffering), and clearer labeling and placement of functionality to reduce learning curve. See also Screenshots of SIMION 8. Enhanced user programming: The Lua programming language is now embedded into SIMION and replaces PRG (though PRG is still supported for backwards compatibility). Lua also replaces the SL Compiler (which compiled down to PRG) and is much more powerful (SL programs have been found to be very easy to convert to Lua). Batch mode operation: Command-line API and Lua interfaces allow SIMION to be operated in “batch mode” from Lua or any other programming language. Operations include GEM –> PA, refine, fast adjust, and fly. One application is geometry optimization (there is a new “geometry_optimization” example included). CAD Import: CAD import (STL) and other import/export functions (from the SL Toolkit) are included. (See also SL Tools Tutorial for older SL docs on this.) Note: SIMION 8 replaces the SL Toolkit, which will no longer be sold separately. New particle definition format: Support for new FLY2 particle definition format (FLY2 File). Original FLY is still supported for backward compatibility though. Max PA size slightly increased from 50 million (in 7.0) to almost 200 million (if sufficient RAM available ~2GB). OS restrictions may apply, though the increased RAM has been tested to work at least under Windows XP. See RAM and Memory. Maximum fast scalable and fast adjustable electrodes increased from 31 to 128. See Max Electrodes. Extended PA capabilities. Crop refined PAs to reduce Fly’m memory usage (Issue-I313). Combine linearly dependents electrodes into the same solution arrays (Issue-I172), which is useful for reducing memory usage in resistor chains. Biot-Savart magnetic field calculation from wire currents (air core). See Biot-Savart Law and Magnets. Improved performance. Rough measurements show refine and fly times reduced by ~20-40% from 7.0, largely due to compiler and display optimizations. New/updated examples - PRG programs have been rewritten in Lua, and documentation has been expanded. 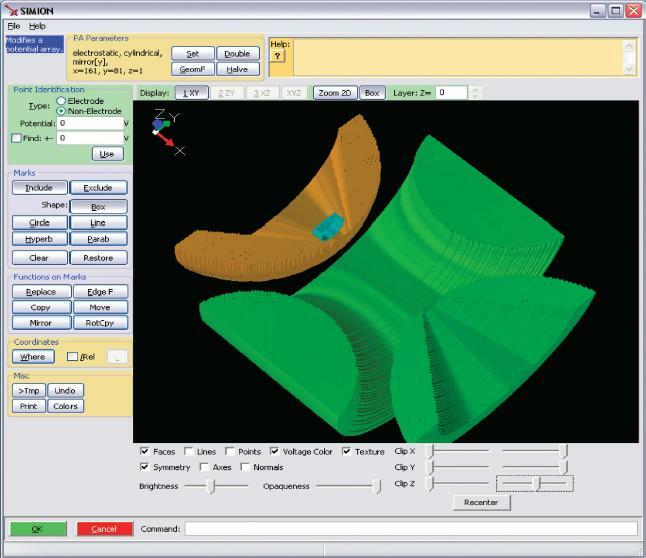 New examples have been added such as geometry optimization / simplex routine, phase plotting in Excel (via LuaCOM), HS1 ion-gas collision model, SDS mobility-diffusion collision model for high pressures, beam emittance calculation, ion funnel, lens properties, magnetic field array import, IMS, HSA, ion funnel, solenoid, and others. Provide for future features and improvements (in anticipation of SIMION 8.1). We plan to continually expand the software as 8.0.x releases after the initial release of 8.0.0. These updates will be provided as free downloads on our web site, for at least a year. For a more detailed change list, see the Software Change Log. Other features are being considered for 8.0.x updates. Compatibility: SIMION 8.0 has a high level of forward and backward compatibility with 7.0. Almost all 7.0 files can be read by 8.0, and 8.0 files can be read in 8.0 provided new features and formats are not used. Performance: SIMION 8.0 generally refines and flies ions faster than SIMION 7.0 (initially by 20-40%, though some reports are much higher). System Requirements: See System Requirements. Both Windows and Linux (under Wine) are supported. Pricing: A discount is provided to existing SIMION 7.0 users and additional discount for SL Toolkit users. Note that SIMION 8 now includes SL, which is no longer available separately. The price of SIMION 8 is the same as the price of SIMION 7+SL. Ordering Info. Upgrades: Similar to as was done with our SL Toolkit, free upgrades will be provided to SIMION 8.0.x (and possibly additional) versions, which will be for at least a year after the initial release of 8.0, as the software is further incrementally developed based on user feedback. SIMION 7.0 will still be supported since it is a stable and widely used version, and many of the concepts remain the same in 8.0. Both 7.0 and 8.0 can be installed and run simultaneously. In fact, 8.0 includes a copy of the 7.0 binary. SIMION 6.0, released in ~ 1996, is no longer formally supported due to OS issues, but we may answer occasional questions on it in the user group. SIMION SL is now incorporated into SIMION 8. It is no longer sold separately, but it will still be supported. It will also be maintained, though major new functionality is now going into SIMION 8.